Thanksgiving is one of my favorite times of year for a couple of reasons. First, I love the point of it, because we don't say thanks often enough, so having the government instate a national holiday and coerce us into saying thanks is pretty useful. I also love every single traditional dish from the turkey to the corn pudding to the yams with marshmallows on top to the homemade cranberry sauce, sitting side by side with the canned kind we just can't let go of, to the bread basket to the gravy to the stuffing and on to desserts which will take a lot longer to list. As it is, that last sentence is way too long, breaking grammar 101, and therefore so unlike me. Besides the menu, I love preparing it all with my mom as we play holiday music and bounce around the kitchen in our slippers and aprons. Morning of Thanksgiving, my sister sits on the couch watching the parade on TV and then the dog show, calling my mom and me out of the kitchen every now and then to see a Broadway performance in the streets of NY or a funny-looking poodle. Each year, I can select whatever breads I want for the bread basket. I am the Bread Basket Manager. I love trying new recipes, so 2007 was the year of a first. I made my first crusty French bread. Got the recipe from Marcy Goldman, one of my baking heroes. I've never attempted a country bread because it's usually a multi-day process and requires some sort of steam bath or pizza stone to allow the bread's crust to form in the oven. In making this one, I prepared a sponge the night before and let it sit out on the counter to bubble till the next day when I'd add the rest of the ingredients. I've almost never seen a dough grow quite so much so fast! Reminded me of the I Love Lucy where Lucy opens the oven door and a loaf just keeps coming at her! 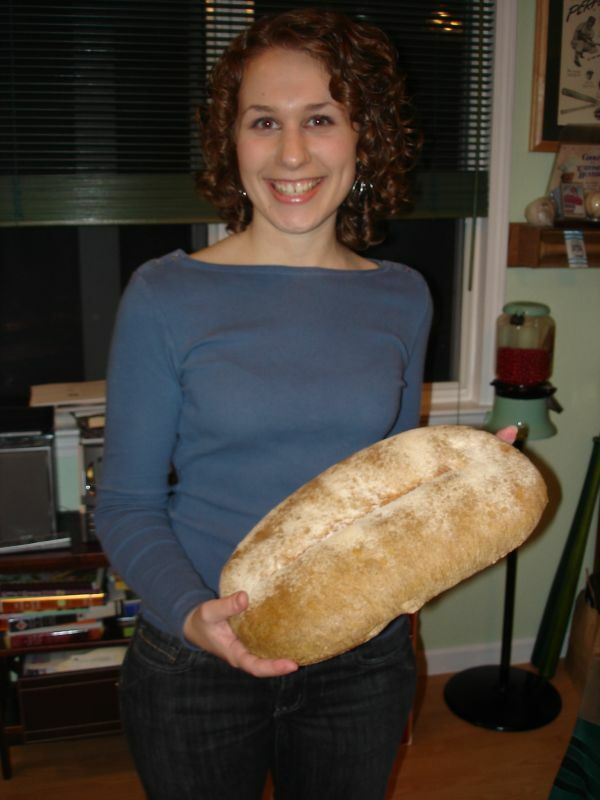 As for this big loaf, the result, according to many a happy eater, was perfection!! I also made delicious Big Fat Rolls from David Rosengarten. First time trying anything of his, and boy, won't be my last. Those rolls are pictured at the beginning. I am already thinking about what I will make next year, as Bread Basket Manager is a lifelong position.